Roll out pastry to a thickness of approximately 5mm and use it to line a 24cm round or rectangular greased tart tin. Allow to rest in fridge. Pre heat oven to 200 C or Gas Mark 7. Line tart with baking parchment and fill with baking beans. Cook for approximately 15-20 minutes until pastry is a light golden colour. Remove from oven, discard baking beans and parchment. Brush base of pastry case with a little beaten egg and continue cooking for another five minutes until pastry is crisp and cooked through. Reduce the oven temperature to 180 C or Gas Mark 6. Meanwhile beat remaining egg yolks and crème fraiche together with cheese and season to taste. Allow pastry case to cool and then carefully spread an even layer of onion marmalade on the base. 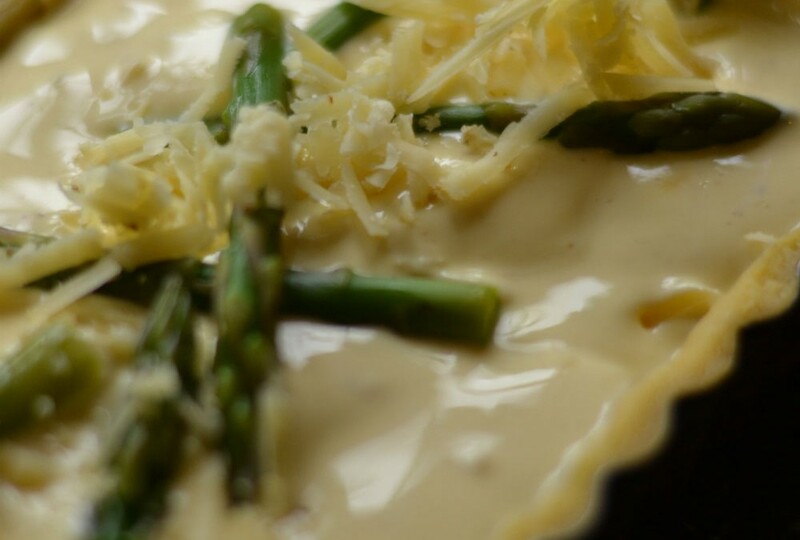 Add prepared asparagus spears that have been cut into even size pieces. Continue to fill tart with egg and cheese mixture, then sprinkle finely chopped chives on top. Cook for another 25-30 minutes until golden brown and set. Serve warm or at room temperature with a watercress and new potato salad. Quicke’s Elderflower Cloth Bound Cheddar is available in most independent delicatessens and farm shops. You can also purchase online http://www.quickes.co.uk/shop/quicke-s-elderflower-clothbound-cheddar. Alternatively substitute with a full flavoured mature cheddar and add a tablespoon of roughly chopped fresh coriander to the egg and cheese mixture for a delicious alternative to this early summer recipe.